The gallery presents two Summer Exhibitions. This exhibition looks at the work of two artists and the relationship between drawing and sculpture. It showcases Jilly Sutton’s wood carvings but also her relief prints and paintings on wood. These are sculptural shapes in two dimensions which use the surface and texture of the wood. Helen Denerley’s sculptures are shown together with her stunning charcoal drawings, many of them life size, illustrating how her drawings and sculpture are integral to each other. Drawn from opposite ends of the country, it is the first time their work has been shown together. 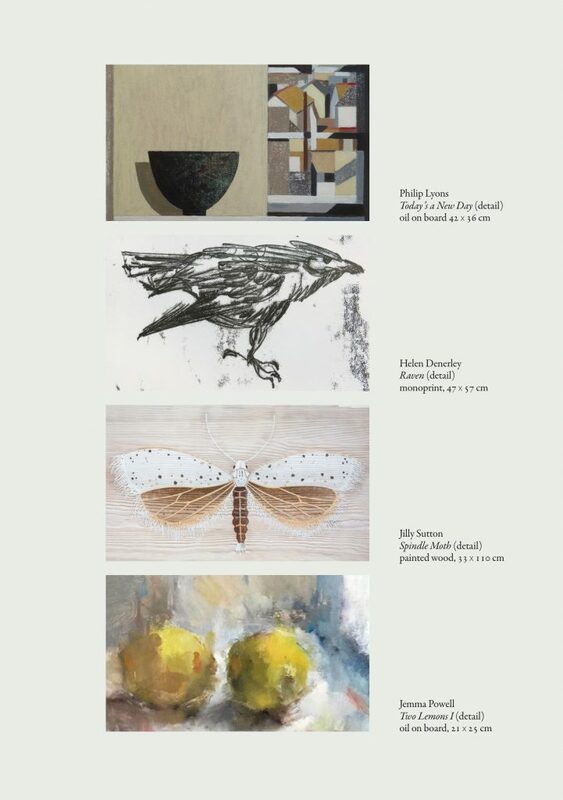 A collection of new paintings, sculptures and collages by Walter Bailey, Sarah Bowman, Oona Campbell, Marzia Colonna, Philip Lyons, Miranda Michels, Maggie O’Brien, Jemma Powell, Lucy Powell, Alexa Rolls, Sarah Walton, Sarah Warley-Cummings, Vivienne Williams. 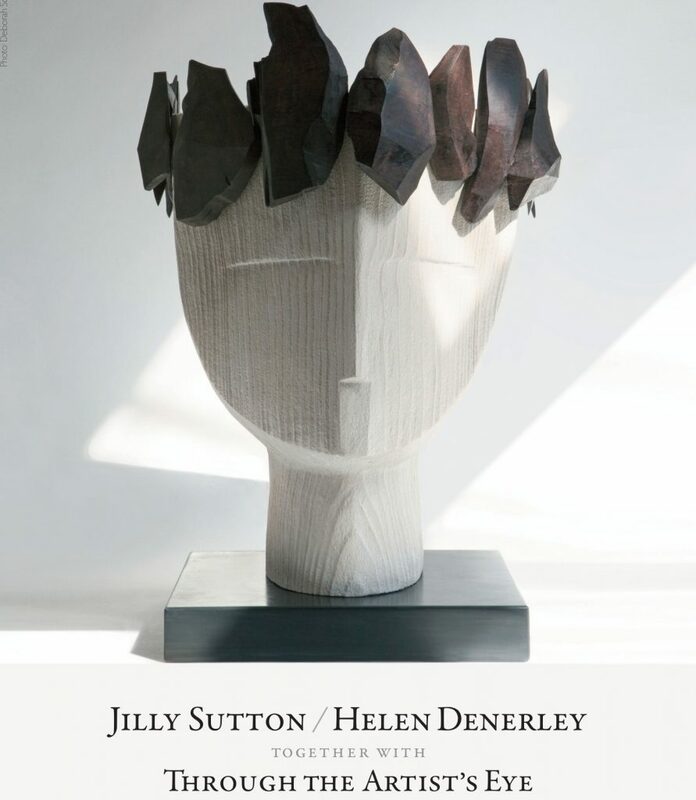 Jilly Sutton is renowned for her remarkable skills as a carver. Starting with an often massive piece of fallen timber she works directly into the wood unlocking the form within but always paying heed to the properties of the material. ‘As a sculptor, you have to think in 3d all the time’, explains Jilly, ‘especially with the “subtraction” way of working, rather than with “building up” as in modelling. There is only one decision with carving which is to take away or not to take away … I start off with drawings from all angles- but as the shape develops, I abandon the drawings and rely on the work to evolve, to take its form from the wood.’Jilly’s 2d relief forms made to hang on the wall are an extension of this process. She has developed inventive techniques of jig-saw printing and relief painting on wood. Texture is a key element in all of her work, exploiting the grain of the wood.Jilly draws daily – fluid, linear sketches – drawing is a necessary part of her process of creating a sculpture. It may be just the ‘scribble of an idea’ or a ‘thinking aloud concept’ or it can develop into a proper scale drawing that fits a piece of wood. ‘It is a process of look-draw-cut-look again.’ Often there is an accidental serendipity to the carving; the cut-away shapes of many of her heads are the result of knots in the wood or areas of rot. Wood is a living breathing medium and Jilly’s work reflects an intimate knowledge of its properties and limitations, her carvings exploit the natural forms and contours of the medium. The force behind her work comes from the tranquillity of her surroundings. Her house and studio are on the banks of the Dart Estuary where the calmness and order of the river continually influence the peacefulness of her work.The Tilt Yard Lady, is a bronze resin cast from a famous Monterey Pine that fell in the jousting court of Dartington Hall Gardens. The rotten area on the left cheek remains to tell the story of the aged, much loved, but very rotten tree. The Architect, also cast in verdigris bronze resin from the original wood assemblage, reflects the chaos and resolution associated with building projects. Jilly studied at Exeter College of Art, the works displayed here are both bronzes and limited edition castings taken from the original carvings and are suitable for display outdoors. Her portrait of the Poet Laureate, Andrew Motion, is now in the National Portrait Gallery. Among her many other commissions are works for the Museum of Liverpool Life and the Royal Institute of British Architects. Many artists have used recycled materials but none like Helen Denerley and her work has an international following. There is something about her creatures that hold our attention. We are drawn first to the head, she begins her pieces with the head, hanging it from a beam so that she can get it at the right height, the heels come next and she gradually fills in the remaining form; somehow describing living muscles, sinew and movement from the inanimate metal. Her sculptures are linear, welded scrap metal coached into graceful curves and sinuous shapes which suggest as much by what they leave out as what they describe. Drawing is key to her process. Helen sees observation and drawing as fundamental to any artist and her work explores the same language and ideas whether it is in two or three dimensions. She studied at Gray’s Academy in Aberdeen, which still teaches the importance of traditional drawing skills. ‘Sculpture for me is a form of drawing in space in three dimensions, I will draw until I know it is right and I can see the finished piece in my mind’s eye’, she explains. ‘What I leave out is just as important as what I put in and the use of space is integral to my work.’ Helen draws daily, sometimes huge life-size charcoal drawings pinned to the walls of her studio. She has been exploring the shape and contours of a Limousine bull, distressed by the way creatures are manipulated for breeding purposes. This has led to a series of monoprints which reference back to the wild bulls of ancient cave paintings.Helen’s farm in Aberdeenshire is surrounded by wildlife, a raven has recently taken up residence, his spirited company is caught on paper. Such drawings may or may not be translated into sculpture but they are fundamental to her creative process. Her work ranges from delicately observed birds and insects to the monumental 24ft giant giraffes in Edinburgh. Her pieces are found all over the world from Japan to Canada. She has an extraordinary skill, born from her sense of draughtsmanship and observation, creating these graceful creatures from the discarded flotsam of our age. 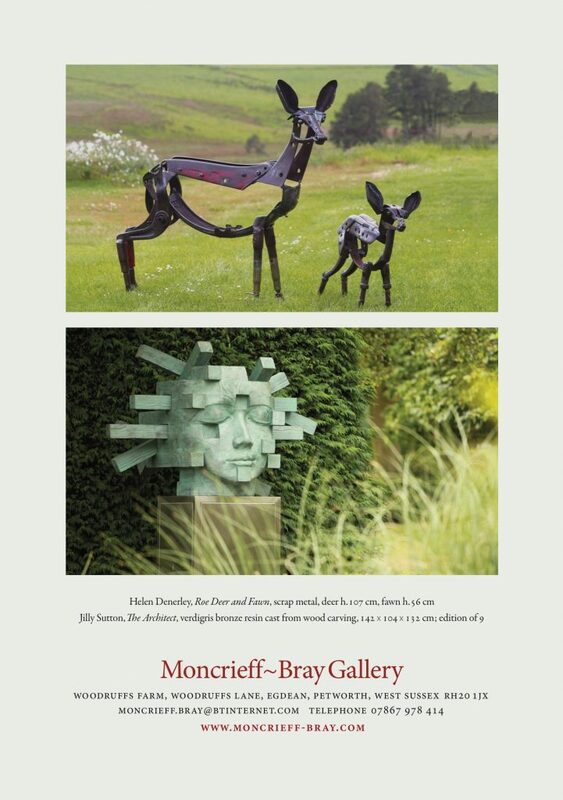 Just over an hour’s drive from central London, the Moncrieff-Bray Gallery is located in the heart of the South Downs National Park, enjoying spectacular views over the Rother Valley. Former curator and arts writer Elspeth Moncrieff set up the Moncrieff-Bray Gallery in 2005. An experienced curator, she worked for many years as a curator at the V&A before becoming Deputy Editor of Apollo magazine and then Art Market Correspondent for the Art Newspaper. She has published several books and applies her experience of the international art world to her South Downs gallery. Based in a group of 18th-century former farm buildings on the edge of the Petworth estate, a spectacular oak framed barn houses the interior gallery space, and the surrounding landscaped gardens are an ideal setting for domestic sculpture.